Thank you very much for booking Gerd to speak and present at your event. To help with your preparations, we have compiled his travel and technical requirements as well as a number of promotional items – including high-resolution photographs- that you might find useful. 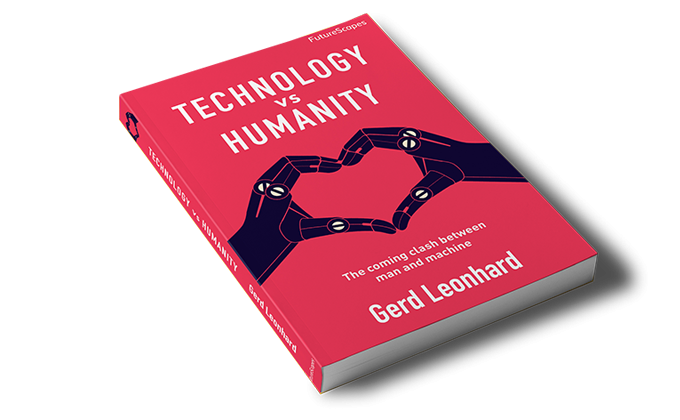 Scroll down to learn how to make Gerd’s best-selling book ‘Technology vs. Humanity’ a part of his appearance at your event, and to review a list of suitable pre-event reading material. A Business Manager from Gerd Leonhard’s team at The Futures Agency will liaise with you by email or telephone to coordinate Gerd’s travel itinerary for timings, locations, air/ground transport and accommodation. For urgent matters, please contact: booking[at]thefuturesagency[°]com. These requirement need to be reviewed by your technical (audio-visual) production team 4-6 weeks prior to the event. For larger events (with more than 800 participants) we usually set up a conference call with your production manager and Gerd’s creative team to discuss these details. For larger events, extra-wide screen setups and cinemascope formats are much preferred, allowing Gerd to make full use of his designs and animations which are customised for each large event (have a look at these videos to see what this looks like). If your production plans supports such a setup please notify us at least 4 weeks prior to the event which exact pixel ratio is required (e.g. 3840 x 1012). Please note that once you have submitted these details we can no longer revert to 16:9. Your production team should be familiar with dealing with Apple DHCP issues which sometimes block video signals from MacBooks. Gerd’s complete technical rider can be downloaded » from here. Gerd makes extensive use of graphics, videos, backgrounds, animations and audio; the default format of his slides – designed in Apple Keynote – is 16:9 (widescreen) ratio. Please note that 4:3 formats are no longer supported, and neither is PowerPoint. Preview decks are provided in PDF and in Apple Keynote. Gerd always runs his presentation from his own MacBook Pro 2018, which has to be on stage with him during the entire speech. No lectern is required, a small table on the side of the stage (within 10 meters of Gerd’s position) is sufficient. Gerd will have all necessary adapters but kindly note that an HDMI connection, audio-out (mini-jack) and power is required. Gerd also uses his own clicker that offers some special effect options. unless this is a small event where Gerd can use his own MacBook as monitor, suitable video monitors should be made available in front of Gerd, on the stage’s floor. Please consider announcing Gerd Leonhard with this freely usable short trailer / visual material before he takes the stage: http://gerd.fm/gerdintros. For his slides, Gerd makes extensive use of graphics, videos, backgrounds and animations. They are essential to his presentations. Kindly advise film teams to consider wide-angle takes whenever he points to slides, or to prepare for adding Gerd’s visuals during post-production. Video clip ‘Technology vs. Humanity. The Future is already here‘. With its timely topics and messages, ‘Technology vs. Humanity‘ book makes a great complement to Gerd Leonhard’s presentations. Most clients and their event managers purchase copies for either all delegates / attendees or for VIPs or the executive team. Gerd is also happy to do ‘Meet-the Author’ book signing-sessions after his speech (during a coffee break, for example). For the English, Spanish, French and Portuguese language editions we can offer a special conference discount at EUR 11.00 or US$ 12.00 per paperback (roughly 30% compared to retail). Shipping from the UK would be extra. Alternatively, we offer discount codes at 20-25% on paperback, ebook and PDF to be included in your delegate pack for participants to purchase the book themselves. Or add a PDF to USB sticks given away with your event material to participants. The book is now available in 10 languages: German, Spanish, French, Portuguese, Korean, and soon in Chinese, Turkish, Russian, and Italian (status: August 2018). Contact books[at]thefuturesagency[°]com for offers and more details, and watch the video clip ‘Technology vs. Humanity. The Future is already here‘. 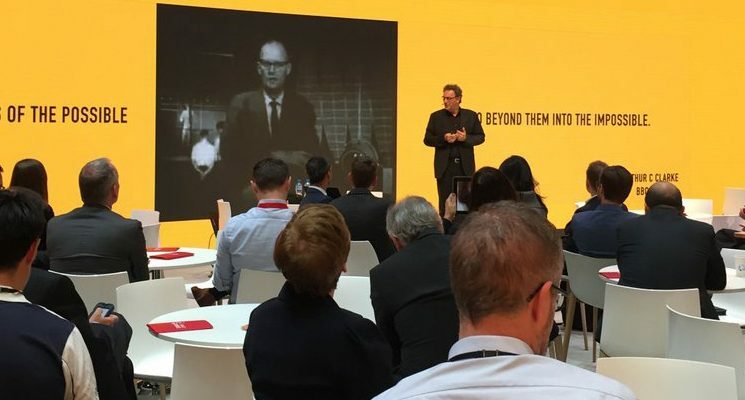 On the topic ‘Technology, Humanity and the Future’ Gerd Leonhard explains in this Youtube video how a pre-recorded video presentation would work with animated slides and audio narration only. As no live video feed is required, this pre-recorded video can run at any time. A live Q&A session with Gerd Leonhard can follow the clip. Should Gerd not be available to travel to an event, he successfully presents via remote talk in high quality with the video conferencing application Zoom. PRE-RECORDED – as explained in the box to the left. Any questions? Please contact us anytime using the contact form above.